Born in Kyoto, in 1958. He graduated from Musashino Art University majoring in Scenography Design. Served as an attraction designer at Amusement Park Development Section in Honda Land Co., Ltd., he created a theme park in Suzuka Circuit where children can conduct vehicles by themselves. 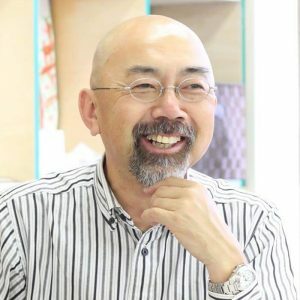 After retiring early, he established the NPO association called “Kids’ Idea Fun School.” Today he manages three schools in Mie prefecture and provides an active learning environment with real experiences to stimulate kids’ imagination and creativity by playing a lot. More than 180 kids come to his school yearly, and almost every year his students have been winning “Kids Idea Contest” held nationwide in Japan. He is a TEDxAnjo 2015 speaker. At his unique school, Toshiki Yamagami focuses on developing kids’ creativity and imagining power. How does he develop these abilities which cannot be taught simply by using textbooks? What can kids acquire meanwhile? In this talk, he shares how he inspires kids to come up with exciting ideas.